In the practice of landscaping, hardscape refers to the paved areas like patio's & sidewalks. 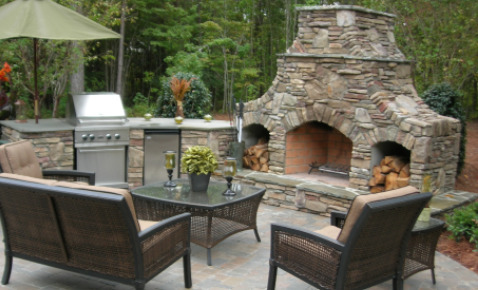 Typical hardscaping examples include brick or paver patios and sidewalks. Retaining walls are often used to create boundaries between hardscapes and earth landscaping features, or softscapes. From an urban planning perspective hardscapes can include very large features, such as paved roads. Most artificial water features are technically hardscapes because they require a barrier to retain the water, instead of letting it drain into the surrounding soil. The term hardscape is used by practitioners of landscape design & architecture to describe the construction materials which are used to improve a landscape. A wide range of hard landscape materials can be used, such as brick, gravel, stone, concrete, timber, bitumen, glass, metals, etc. For the designer, it is important to choose hard landscape products and materials which 'work together' much like interior design. 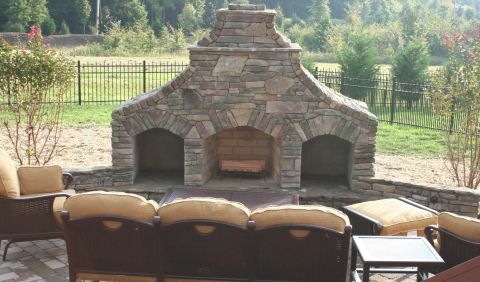 Hard landscape can also describe outdoor furniture and various other landscape products. Retaining walls serve to retain the lateral pressure of soil. The basement wall is thus one form of retaining wall. The term is most often used to refer to a cantilever retaining wall, which is a freestanding structure without lateral support at its top. Typically retaining walls are cantilevered from a footing extending up beyond the grade on one side and retaining a higher level grade on the opposite side. The walls must resist the lateral pressures generated by loose soils or, in some cases, water pressures. The most important consideration in proper design and installation of retaining walls is to recognize and counteract the fact that the retained material is attempting to move forward and downslope due to gravity. Lateral earth pressures are typically smallest at the top of the wall and increase toward the bottom. Earth pressures will push the wall forward or overturn it if not properly addressed. It is very important to have proper drainage behind the wall as it is critical to the performance of retaining walls. Drainage materials will reduce or eliminate the hydrostatic pressure and will therefore greatly improve the stability of the material behind the wall, assuming that this is not a retaining wall for water.